You might be familiar with these buns because they resemble char siu bao, the grab-and-go barbecue pork bun that is a Chinese street food staple. 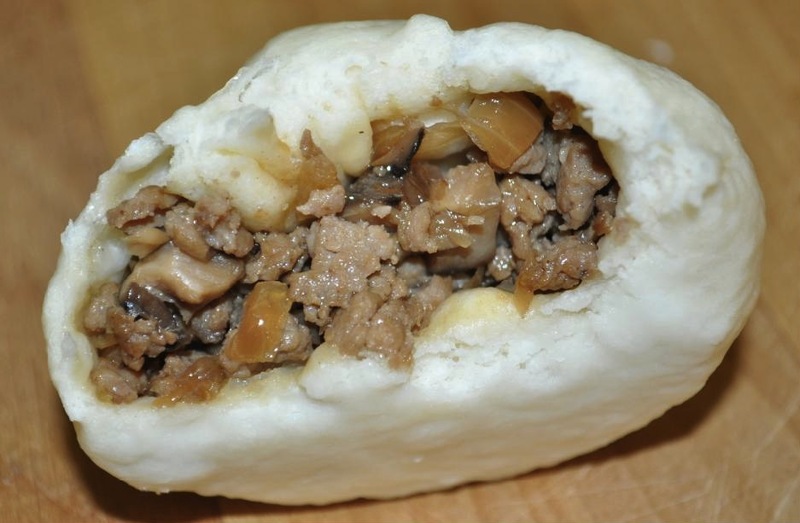 This version of the pork bun has more in common with the pork buns you mind find in the night markets or buy in bulk from a bakery in Taiwan. 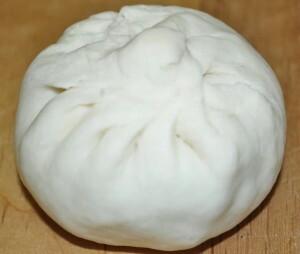 If you’ve never made your own steamed buns but enjoy making bread, you might enjoy the hands-on process of bun-making, perhaps the closest thing in traditional Taiwanese cuisine to baking bread. Marinate ground pork with the ingredients listed under section (a) of seasoning ingredient list and mix well. Heat 3 tablespoons of cooking oil, add mushroom and stir fry for two to three minutes over medium heat. 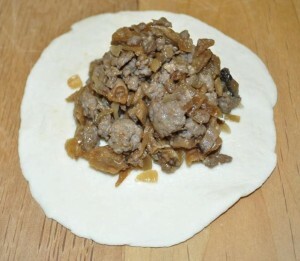 Then add ground pork and raise the heat to medium-high temperature. Stir fry until the ground pork has separated and begun to form small pieces. This should take about four to five minutes. Add onion and continue cooking for four minutes, then mix in the chopped radish. Cook for another minute, add 3 tablespoons of soy sauce, and blend well. Mix in dried shallots and pour in tapioca starch water. Mix well and then turn off the heat. 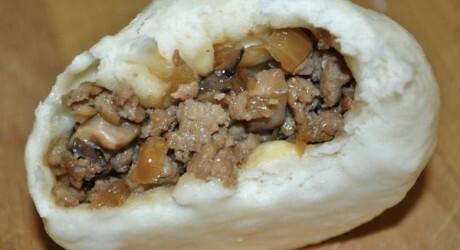 The filling is ready to use. Mix flour, yeast, baking powder and sugar in a big bowl. 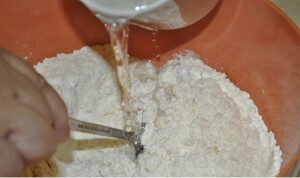 Add water and stir the contents of the bowl until the mixture thickens into chunks. 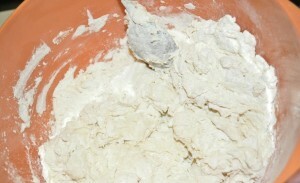 Next use your hands to knead the chunks into smooth dough. 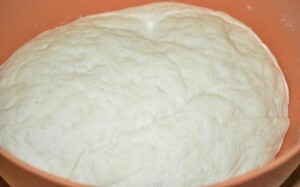 Set the dough in a large bowl and cover with plastic wrap. Set aside until the dough doubles in size after rising. 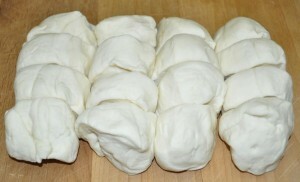 Remove the dough from the bowl, place on a board and cut into 16 to 20 pieces, sized according to your preference. 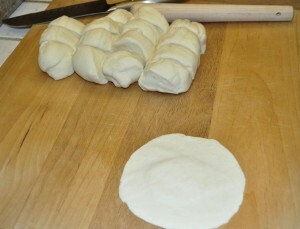 Roll each dough piece into a round shape, with a thick center and somewhat less thick edges. 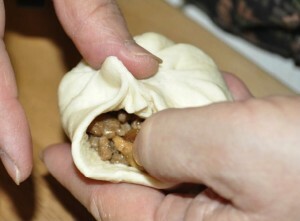 Place 2 or 3 tablespoons of filling in the center of the dough wrapper. Using your thumb and index finger to hold the edge of wrapper and your left hand to hold the bottom of wrapper, turn while making folds counterclockwise. 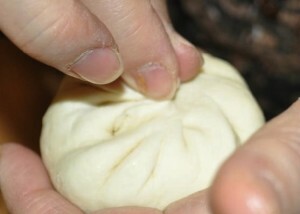 At the end, seal the opening at the top by pressing dough edges together. Note: I place each wrapped bun on a piece of wax paper for easy handling. If you decide to do this, I recommend cutting wax paper into properly sized sheets in advance. Set the buns aside for about 10 minutes and then let them rise again. Boil water and steam the buns for 12 minutes over high temperature. 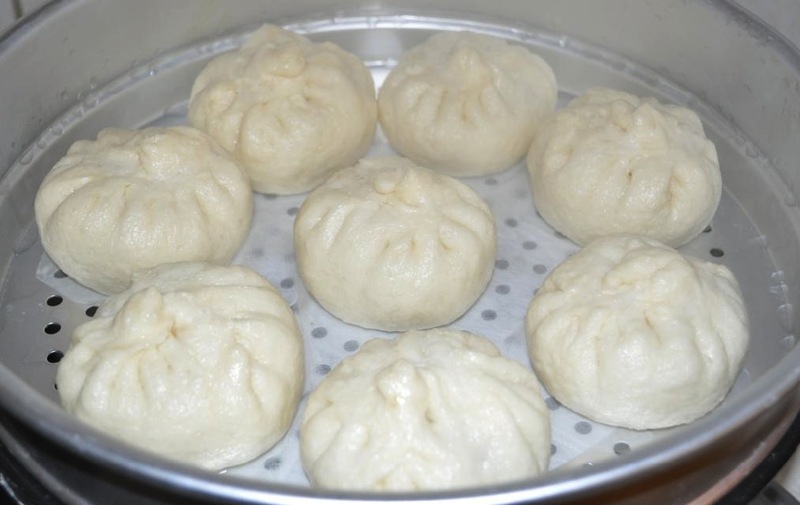 Your homemade steam buns are now ready. Note that this makes 16-20 buns. 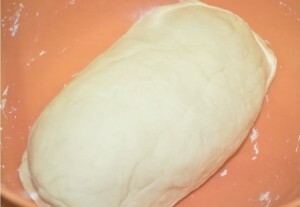 Be sure to cover the dough during this process to ensure that it does not dry out. With practice, the aesthetics of your buns will gradually improve. Your first batch of buns might not be beautiful, but they will be delicious.